Stop by any of the Bunce Rental, Inc. locations in Tacoma, Puyallup, and Spanaway WA to fill your propane cylinder for your bbq, camper, rv, forklift, or heater. For brand new cylinders, we also provide purging services before filling the tank for an additional fee. The cylinder must be outfitted with an Overfill Protection Device (OPD). You can tell if your cylinder has an OPD valve, by the shape of the handles; cylinders with a triangle-shaped handle have an OPD valve. 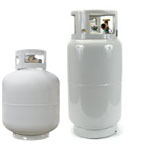 If a cylinder has a round or star-shaped handle, it does not have an OPD valve and we cannot fill the propane cylinder. The certification date stamped on the cylinder must be less than 12 years old. Tanks not meeting the date requirement must be recertified by authorized personnel before we can fill the cylinder. If you would like to have your propane tank recertified contact Black Bear Outpost in Spanaway for more information.